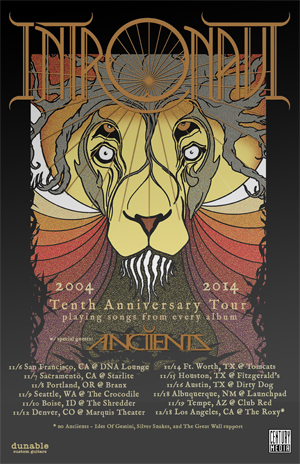 INTRONAUT will hit the road next week starting San Francisco. The band has been on the road in support of their current album Habitual Levitations ever since its release on Century Media in March of 2013. This special run of shows is in celebration of the band's 10 year anniversary! "We're taking a break from writing a new record to celebrate our 10th anniversary as a band with this special run of shows. We haven't finalized a set list yet, but expect at least one song from every release, and maybe a special guest or two to come out and help us play them. Joining us on these shows will be our Canadian friends ANCIIENTS, and the LA show will feature IDES OF GEMINI, SILVER SNAKES and THE GREAT WALL. We are also planning a couple special 10th Anniversary releases, hopefully to be available by this tour, so keep an eye out for that. Thank you to everyone who has supported Intronaut for these past 10 years! We love you forever."